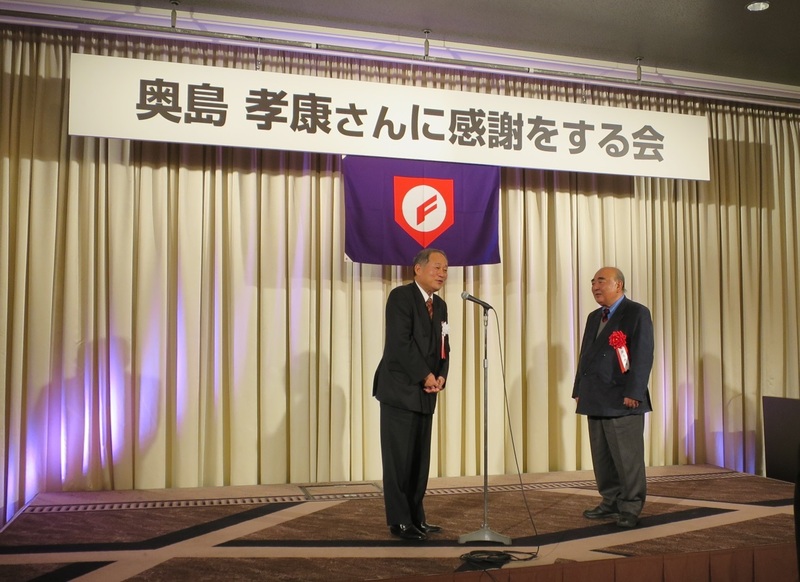 Dr. Eiji Hatta, current JHBF President presented (left) a plaque in honor of his predecessor. 170 school personnel and well-wishers in various quarters gathered at the Hankyu International Hotel in Osaka on November 20 to say thanks to Dr. Takayasu Okushima (76), 6th President of Japan High School Baseball Federation (JHBF). The gathering recognized the fact that one of the challenges which he successfully overcome during his term in office for 7 years, was his decision to go ahead with the National High School Invitational Tournament in March, 2011 which unified Japan immediately after the whole nation had been at a loss the Great East Japan Earthquake and accompanying tsunami disaster. Dr. Eiji Hatta (66) succeeded Dr. Takayasu Okushima as President of JHBF on September 16, 2015 and remains as President of Japan Student Baseball Association, which oversees JHBF and All-Japan University Baseball Federation. As it was for his predecessor, President Hatta considers education is a vital part of high school baseball, he strives to contribute for the good of student baseball with particular emphasis on education as well as placing emphasis on responding to internationalization.